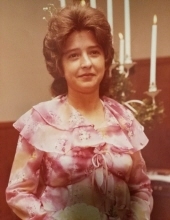 Patricia Ann Lipscomb Rose, 72, passed away on Thursday, January 31, 2019 at Wayne UNC Healthcare surrounded by her family. Ann was born in Wayne County on March 22, 1946 to the late Edgar and Haden Dessiree Dail Lipscomb. She was married to the late Douglas McArthur Rose. A service to celebrate Ann’s life will be held on Tuesday, February 5, 2019 at 11:00 a.m. in the chapel of Seymour Funeral Home with Rev. John Howard officiating. Interment will follow in the Nahunta Cemetery. The family will receive friends on Monday, February 4, 2019 from 6:00 – 8:00 p.m. at Seymour Funeral Home and other times at the home of her sister, Linda James, 834 Forehand Road, Pikeville. Ann is survived by her sons, Michael Rose and wife Tracy of Goldsboro, Paul Rose and wife April of Fremont and Jeffrey Rose of Fremont; sister, Linda James of Pikeville; brothers, George Lipscomb of Goldsboro and Dennis Lipscomb of Pikeville; grandchildren, Matthew Rose, David Rose, Melody Rose, Laura Rose Herring and husband Tyler, Daniel Rose, Dylan Rose, Stuart Rose, Jacob Rose and Alexis Rose; and six great-grandchildren. In addition to her husband and parents, she was preceded in death by her sisters, Connie Parrish and Vonnie Lipscomb; and brother, James Weston. To send flowers or a remembrance gift to the family of Patricia Ann Rose, please visit our Tribute Store. "Email Address" would like to share the life celebration of Patricia Ann Rose. Click on the "link" to go to share a favorite memory or leave a condolence message for the family.